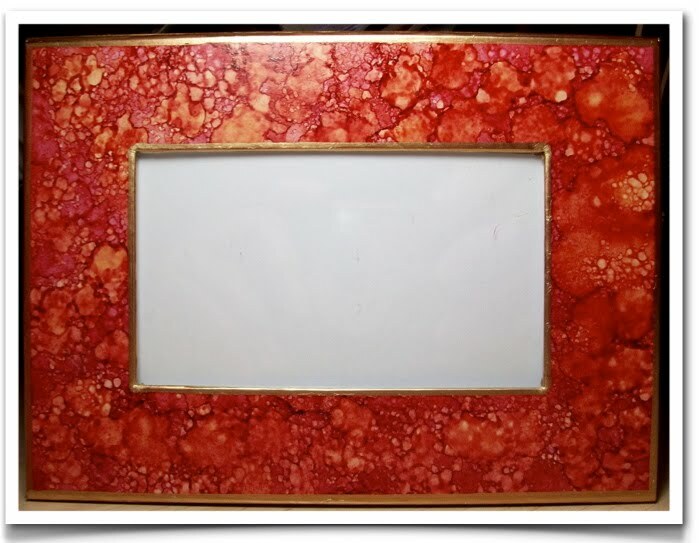 today i was a guest on cool2craft web tv...i demonstrated a quick and easy marbling technique with alcohol inks on this ready-to-go! blank cardkeeper box. this is the top of the lid shown. you can watch the archive of today's show; it stays up for a few weeks. there's a link on the cool2craft site. i chose two ink colors - butterscotch and cranberry. I started with a quick wash of butterscotch all over the box, then I tapped the cranberry ink with my applicator on top to create the marbled effect, then i tapped again with the butterscotch to really blend the colors. then i lined the edges with a gold leafing pen. 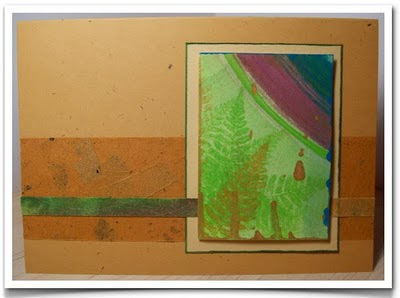 click here for my little video tutorial on this technique for the cardkeeper...and while you're on my youtube channel, you'll see another tutorial there for marbling on vellum paper too. i will make a set of nice greeting cards to go inside this box, and then i'm donating it to one of scrapbook royalty's silent auctions, benefiting a local community center that serves the homeless. this auction will be held at the scraptacular getaway retreat coming up in april. i am also teaching two sessions of "layouts with lutradur" for the retreat attendees...more on that later! if you want to try this project yourself, you can order the cardkeeper and a selection of alcohol inks from my online shop at lisalizalou.com. prices are always 25% off retail, and for this week only, you get low, low shipping rates! plus i'm giving a free gift with the purchase of a cardkeeper box this week - all the papers and embellies you need to make a cute greeting card to go inside. 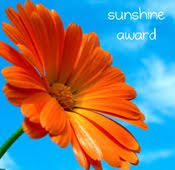 a couple of my fellow bloggers, artgirl and carole, kindly gave me a "sunshine award" for sharing my creativity. thanks ladies!! 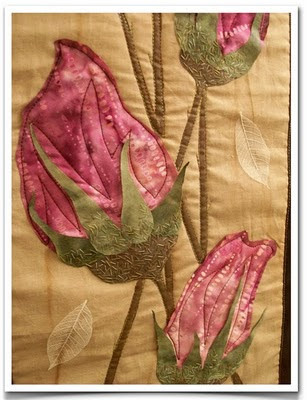 i encourage you to visit their blogs—their work with fabric and other mediums is wonderful! to keep the good karma going, here are just a few creative bloggers whose work i enjoy, and i think you will too...let that sunshine in! 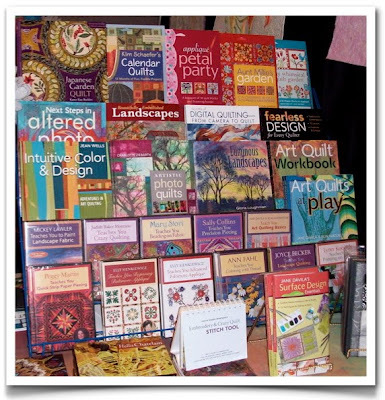 i had a booth at my local guild's annual quilt show this weekend, selling lots of books and products from c&t. it was well-attended, and all the members worked so hard to create lovely quilts to display. a gorgeous opportunity quilt was raffled off (won by a guild member) that was a result of hundreds of hours of handwork by a dedicated group of quilters. i taught a quick fabric painting class using a few basic techniques from jane davila's surface design essentials. it was a full house, about 25 women joined me in getting some paint on our hands! i also participated in my very first quilt challenge! we had to use two specific batik fabrics within a rose-theme. i decided to design my own wallhanging with raw-edge applique, paint, hand stitching and machine stitching. i cut out the rosebuds and the individual sepals freehand - i just tried to keep the shapes sort of organic-looking. then i painted the individual sepals with pouring medium to make them stiff so they could remain detached from the tea-stained foundation fabric without flopping over. i also dabbed a little medium around the edges of the pink buds to prevent fraying. i used a glue stick to put each part of the rosebuds in place, then i hand-stitched the sepals to the base of each bud with a variegated green and gold thread. my friends tease me that these stitches look like aphids :-) but i just liked the texture. i painted the stems super straight (i sort of liked how the straight lines contrasted with the curves of the buds) then sandwiched my quilt top with a thin batting and a dark brown batik backer fabric and pinned the layers together. i wanted all my machine time to do triple-duty...appliqué, decorative stitching, and quilting...all together. i stitched alongside the stems, giving them little thorns with the thread, then i switched thread colors and stitched a random petal-ish pattern on each bud. lastly, i folded the backer fabric up toward the front to create the binding so i could machine stitch that too...i was racing against the clock to get my quilt done in time to hang with the other challenge quilts at the show! i embellished with a few leaf skeletons and that was that! overall, it measures just 10"x27" - a nice little wallhanging if i do say so myself! i'm just so slap-happy to have had the chance to hang something i made in a show...well okay, the challenge quilts were hung in the café area, separate from the real show...but it was exciting all the same! click here to see my little video of the challenge quilt display on facebook, and click here to see pictures of the show on flickr. today i was a featured guest on this fun interactive webTV show called cool2craft. 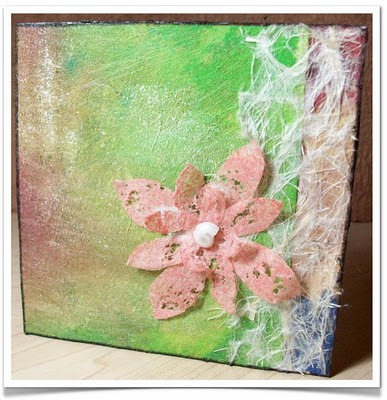 i demonstrated some different things you can make with lutradur...such as this cute spring-themed accordion-fold wallet for your artist trading cards. here are the instructions - enjoy! • three small squares of lutradur - 2.5", 2", 1.5"
1. fold the large sheet of lutradur in half, lay it in front of you with the fold edge at the top, then flip up 2" of the bottom edge toward the center fold and press. turn over and repeat for the other side. see diagram below. 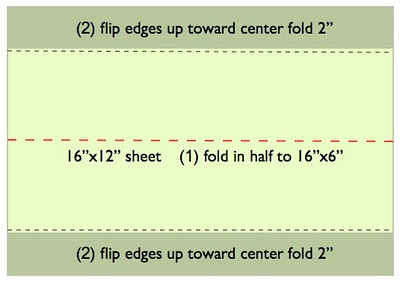 2. accordion-fold your folded strip into four 4"x4" sections. see diagram below. 3. adhere a piece of chipboard to each end of your accordion-folded pockets. add glue to seal the edges of pockets. set aside. 4. paint the 4" square piece of lutradur for the wallet cover. i used green, yellow, bronze, red and blue, randomly brushing and blending the colors. paint will seep through the lutradur, so be sure to work on top of another sheet of paper. allow to dry. 5. paint a coat of iridescent medium on top of color. allow to dry. 6. glue a strip of deckle accent paper to one side of the cover. 7. from each of the smaller lutradur squares, cut out a simple four-pointed flower shape. 8. adhere the 3 flower shapes on top of each other with craft glue in the center (small, then medium, then large), rotating the petal on each layer. 9. pick up the flower with the tweezers and briskly wave the heat gun over the petals to melt and distress - careful not to get too close and melt the whole petal away! 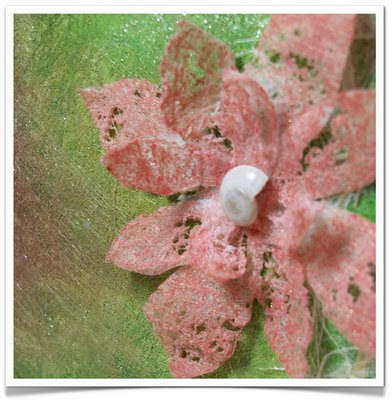 10. spritz the flower with desired color of spray mist paint and adhere the shell to the center, set aside. 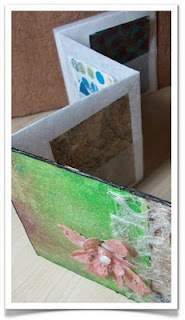 11. adhere the painted cover to the front piece (either end can be designated as the front) of chipboard, allow to dry under a book or other weighted object. 12. repeat steps 4, 5, 6 and 11, if you want to decorate the back cover also. i left my back cover undecorated. 13. adhere the flower to the front cover. 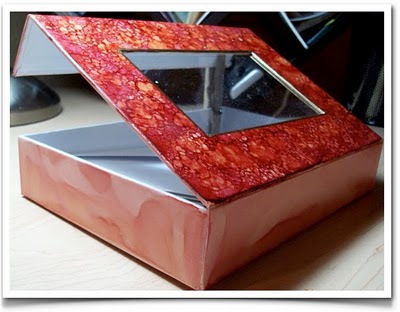 14. use a paint marker to rim the edges of the cover with a contrasting color. 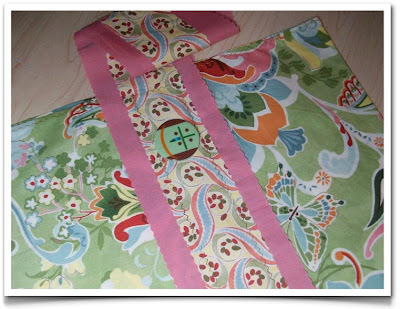 15. load up each pocket with atc's and tie a pretty ribbon around it to keep it shut when traveling. it also makes a nice free-standing atc display when spread out. i love the simplicity of an atc for a greeting card. 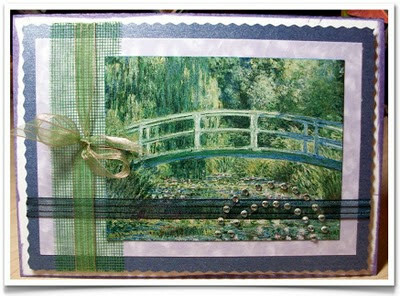 i painted and stamped this atc while i was demonstrating at a trade show. the thin strip is painted lutradur...i love painting a sheet with random washes of color, then slicing into strips. this 70 gram weight of lutradur doesn't tear or fray, so you can make beautiful custom ribbon for flat applications (it's a little stiff for tying into a bow). the wide strip is unryu paper with mango leaves embedded inside, and the cardstock is recycled paper with little fiber flecks. natural, bright, simple. i like it! my coworker commissioned me to make a super-rush birthday card and gift for her mother-in-law. i strung some pretty hematite and agate beads together to make a simple necklace with matching earrings (which i completely forgot to snap a picture of). she said the gift went over well - yay! here is the birthday card, a quick and easy layout. i just love using fine art postcards as focus paper, this is from a postcard book i bought at the museum when they had the monet in normandy exhibit, called waterlilies and japanese bridge. trim white cardstock to 7"x10" and score in the center to fold to 5"x7"
thanks for so many kind comments about these little pouches! i just had to share the other cute fabrics i used...the florals are from the "posh by chez moi" line with moda and the pink accent is just a store-brand solid. in the first post, the flower and paisley fabrics are from the possibilities line at quilting treasures, and the green dot for the accent is from patrick lose's line with robert kaufman. i'll put the measurements and directions to make these into my next newsletter...which needs to get written right about now!